Despite chilly, rainy days in the recent weeks of early spring, May will soon be showing us the brighter and warmer days which are perfect for planting garden greens. When it comes to cultivating different kinds of leafy greens to join into your meals, Robyn Jasko of Kutztown has the perfect background to give great recommendations. Jasko is the co-founder of the organic community garden in Kutztown, which is on the grounds of the Pennsylvania German Cultural Heritage Center on Kutztown University’s campus. She served as the garden’s co-manager for several years and is the author of Homesweet Homegrown: How to Grow, Make and Store Food, No Matter Where You Live, which she published in 2012. By 2013, Jasko opened Homesweet Homegrown, LLC, which specializes in producing hot sauces with the peppers she grows “using organic practices, biodynamic farming methods and zero pesticides or sprays.” The business is also now Certified Naturally Grown. In the past, Jasko has grown bok choy, kale, collards and mustard greens. She’ll soon be planting kale and arugula as some of her crops on three acres of farmland in Kutztown. Jasko prefers to grow seeds directly in the ground since she says transplanting can be tough on plants. “They are stronger and less prone to disease and pests if they are planted directly in the ground,” she notes. Jasko points out that seed packets are a great resource of information. Read them well ahead of time and save them for easy reference. “Definitely check seed packets to know what grows when–you don’t want to plant radishes or lettuce in the height of summer, or they will bolt (AKA, go to seed),” she says. Since seeds for greens are so incredibly small, Jasko uses a Jang seeder or similar gardening tools because hand-seeding often leads to over-seeding, which wastes seeds and takes up more time later in thinning out the plants. “Using a seeder gives you perfect spacing and rows, making it very easy to weed and plant,” Jasko says. And since greens can go to seed suddenly sooner than we often realize they will, Jasko has a way to be sure to use this to your benefit. Jasko says to trim greens for harvesting every 2 to 3 weeks but sometimes more often, if necessary. Jasko tends to use scissors or a knife to cut most greens, but she simply breaks off kale and collards with her hands. In some cases, especially with lettuce, the plants can grow for a while and taste bitter, but Jasko explains that this is just part of the life cycle of the plants. Then there are pests and predators to consider. “Voles make little tunnels in the soil, and groundhogs and deer will eat the entire plant down to the roots,” Jasko notes. “Deer and groundhogs are the biggest culprits. And who can blame them. Greens are tasty! I use solar-powered gopher and vole sticks to keep them at bay. I bought them on Amazon.com, and they emit a sound and vibration every 30 minutes. The critters don’t like the sound and vibration, so this has kept them away from Jasko’s plants well every year, she confirms. Deer fencing is another resource she uses. And Now It’s Salad Time! Now onto the delectable part where you can think about what to create with what you grow. This arugula salad recipe is easy, quick to make, simple and full of compelling flavors. 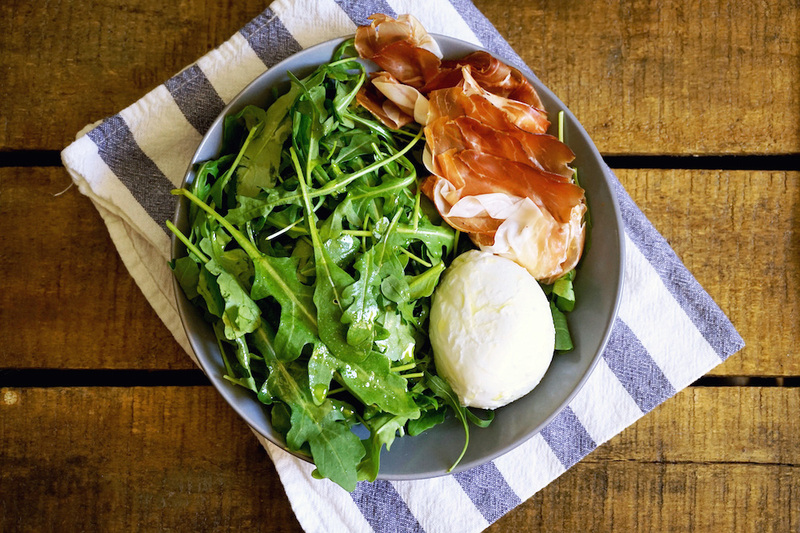 In a bowl, add enough freshly washed arugula for whatever size of salad you need. Cut enough burrata or mozzarella to give a good amount of its flavor to the salad, per bowl. 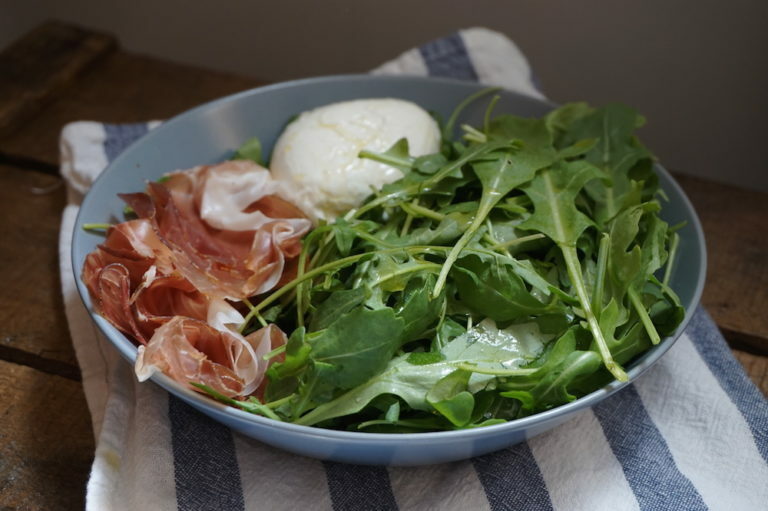 Join a few prosciutto or speck slices to each salad you're making. Drizzle a bit of olive oil over the ingredients. Finish with a light sprinkling of sea salt.